Continuing on my curiosity and liking for exploring the hidden and forgotten heritage sites of Bangalore An article in Deccan Herald prompted me to visit a temple in Domlur . 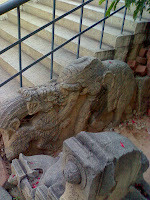 This blog is on perhaps the oldest and ancient temple in Bangalore encompassed by congested vicinity of Domlur. I decided to visit the temple. But there was a problem. Majority of people I knew in Bangalore didn’t seem to know about the temple. But finally after lot of enquiry I got a fair indication on the location of the temple from one of my friends in Domlur.The temple was at a high base and seemed to be renovated recently. After climbing small steps we reached the entrance. Near the entrance there was a portrait depicting the state of the temple as on 15th August 1947 (India’s Independence Day). Only a mound with entrance existed then. The idol is small but very beautiful and the place has some thing special about it. There is also a very old Anjaneya temple near the Chokkanathan temple which is worth visiting. The head of Anjaneya is said to be at the level of Lord Chokkanathan’s feet. The temple had suffered the ravages of time but now has been restored. 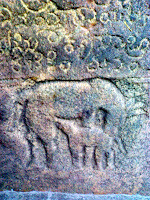 Tombalur (the present Domlur) alias Desimaanikka Pattinam in the region of Ilaippakka Nadu (the present city of Bangalore) of the country the Thadikaipaadi (Karnataka).Renamed as Rajaraja Chola Valanaadu after Chola Conquest later renamed Rajendra Chola Valanaadu during Rajendra Chola era. Temple was constructed by a Tamil Chettiar named Thiripuraanthakan of Talakkaadu and his wife Chettichchi Parpathi in the 10th Century. Landmark to visit the temple : The Road Besides Steve's Gym on Airport Road (Domlur) opposite New Shanti Sagar leads to the temple. I am currently working on an album on Nandi temple, will post it soon. Meanwhile you can have a look at http://picasaweb.google.co.in/karnataka.explored also at www.msg4saurabh.blogspot.com. 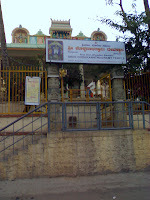 I am from Bangalore and this temple was telecaseted on 3rd Nov Sunday in Kasturi Newz 24 channel. I visited this temple. Now this temple has got its fame and people there can guide you easily.